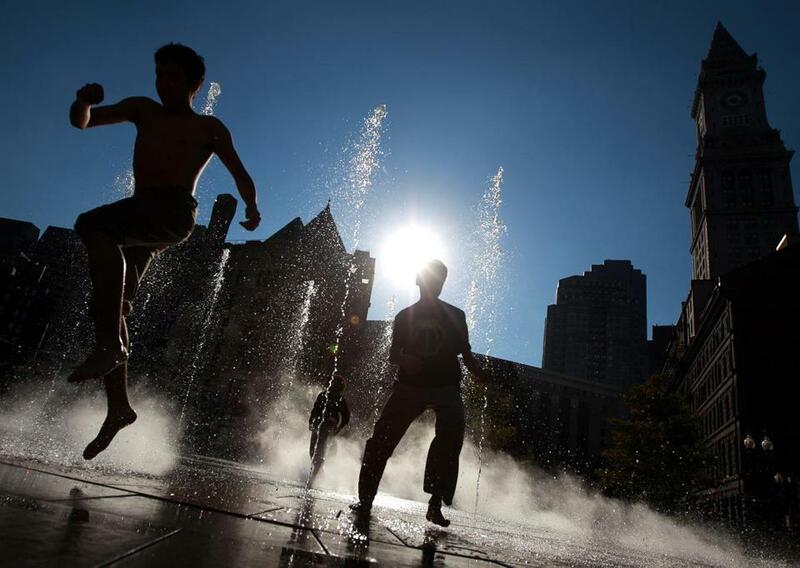 The Rose Kennedy Greenway offers plenty of diversions for visitors, including seven water features. This Help Desk story is the result of a reader’s question about where to take guests in and around the city that won’t cost a fortune. If you have a question you’d like Globe writers to address, submit it online here or e-mail editor Chris Morris at christine.morris@globe.com. When Kristin and Jon Vrandenburg of Quincy, Ill., visited Boston this summer, they were surprised by its affordability. (They were also shocked by the terrible traffic, but that’s another story.) Soaking up the scene in our colorful, lively city turned out to be a fairly inexpensive proposition, Kristin says. “We had an awesome time without spending a lot of money.” No doubt it helps to have a travel writer in the family (i.e., Diane Bair), dispensing advice. Of course, you can drop big bucks in the city, hitting the major museums at $25-plus a pop, and dining at the buzziest restaurants (entrees at $25-plus a pop), but you don’t have to go super-spendy to enjoy what our vibrant city has to offer. 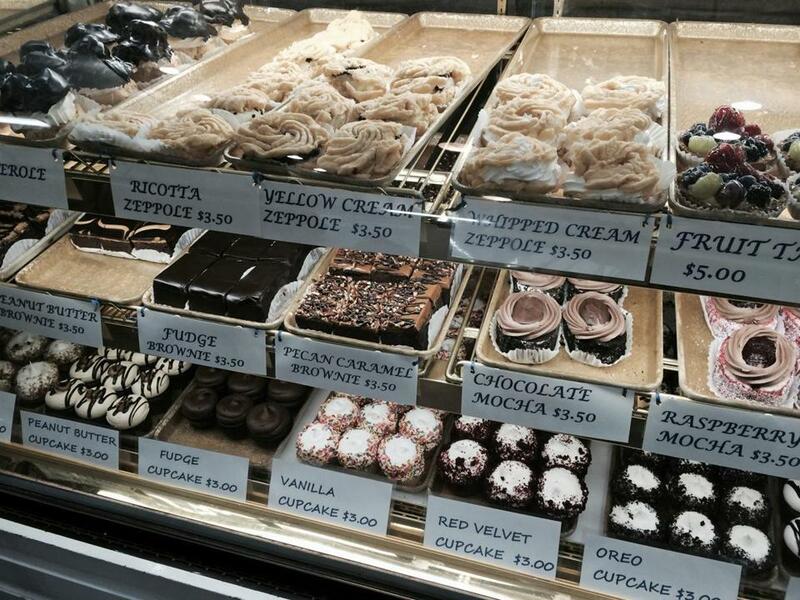 Some of the best things in Boston, as in life, really are free, or at least cheap. We’ve found that guests get excited about places we locals take for granted, like our ancient cemeteries, the Haymarket, and the venerable Freedom Trail — that you won’t find in Quincy, Ill. (Want proof? Stand on Hull Street in the North End for a few minutes, and see how many people pose for selfies with the Old North Church.) Find out which primo attractions your guests are the most keen to see — aquarium, science museum, children’s museum, arts institutions — and book accordingly. Don’t feel like they have to see them all. Who has that kind of stamina? Savvy culture-vultures take advantage of the discounted and free museum passes at the Boston Public Library (www.bpl.org.) All you need is a BPL library card to reserve passes over the phone, in person, or on one of the library’s computers. Talk about a deal: The Museum of Science pass will admit up to four people free, as will the New England Aquarium pass (available from September-June only.) Several museums offer library pass discounts that net big savings. For example, you can get up to four people into the Isabella Stewart Gardner Museum for $5 each on weekdays (two people on weekends and holidays), and $10 gets two folks into the Institute of Contemporary Art; while $10 per person (with a limit of two people) will get you into the Museum of Fine Arts. The new ICA Watershed in East Boston is free for all, no pass needed. 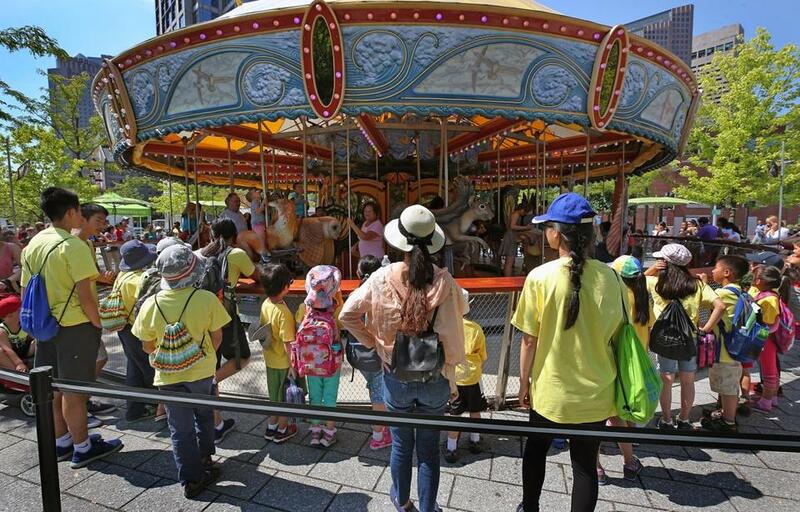 The Greenway carousel features Massachusetts critters. Take your posse to the Rose Kennedy Greenway to see the post-Big-Dig transformation — everyone’s impressed — and there’s always something going on, like the recent “GLOW — Neon Signs in Massachusetts, 1925-70” exhibit, artisans’ markets, Zumba, lawn games, live music — and end up at the Greenway Carousel. Because who doesn’t want to ride on an oarfish? For $3, you get a sweet spin, and if you’re lucky, the Cookie Monstah (@monstahtruck) food truck will be parked nearby, where $6 gets you a hefty ice cream sandwich. And look what else is in the neighborhood: Quincy Market, the Boston host’s best friend. Where else can you find food that everyone from the vegan to the chowder-lover to the kid who only eats pasta can embrace? It’s not ultra-cheap, but there’s plenty of variety at the myriad food stalls. Ditto Boston Public Market, a great showcase of local fare. And don’t skip over Faneuil Hall — besides prompting a lively discussion regarding a name change (and Boston’s role in the slave trade), the free site hosts National Park Service rangers in the Great Hall, who give 15- to 20-minute talks on the building’s history (daily, year-round). You’ll likely encounter street performers here, too, to the delight of the kids in your crew. A visitor to Boston must do a walking tour, be it the Freedom Trail, the Black Heritage Trail, or Harborwalk. Good news for hosts: You don’t have to narrate the first two if you hook your guests up with a free ranger-led walk offered by the National Park Service. Freedom Trail ranger walks continue through October. Ranger-led tours of the Black Heritage Trail run twice a day through Labor Day, and then once daily, weather permitting. Some of the 14 sites on the trail are private, but others, like the Museum of African History’s Abiel Smith School and the African Meeting House, are open for touring. For details on both, see www.nps.org. If you’ve not done Harborwalk yourself, make a point to go — the views are great, and, if you’ve been around awhile, you’ll recall the No Man’s Land that Boston’s waterfront used to be. One of the spots that proved to be a sleeper hit with our guests: the Marriott Boston Customs House, one of the city’s first skyscrapers. This iconic 492-foot structure was the tallest building in the city from 1915 to 1965 (when the Pru was built.) A 26th-floor observation deck is open twice daily (2 p.m. and 6 p.m., except Friday, $7), weather permitting. Gorgeous building and cool views, guests agree. Diane Bair FOR THE BOSTON GLOBE. Most guests enjoy a tour of the sights in the North End, capped with a visit to one of the famous pastry shops, like Mike’s Pastry on Hanover Street. Of course, your guests will want to wander through the Boston Common and the Public Garden and Newbury Street (don’t forget to pop into the Boston Public Library’s McKim Building — and they offer free Art & Architecture tours); all of these are perennial crowd-pleasers. And what kind of host would you be if you didn’t take your squad to the North End for a cannoli at Mike’s Pastry or Modern Pastry, or a pie at Pizzeria Regina? Remarkably, everyone on the planet seems to know about Regina’s pizza, and guess what: It’s still really good, in our humble opinion. .com) don’t stop when baseball season ends. Sixty-minute tours run from 9 to 5 in baseball season, and 10 to 5 from November through the end of March. Cost is $20 for adults but so worth it to a baseball fan. What do you do with a guest who’s been here often, and done it all? Do some sleuthing, and find an event at www.bostonusa.com or www.thebostoncalendar.com (and of course, the Globe). David O’Donnell of the Greater Boston Convention & Visitors Bureau has a suggestion for Columbus Day weekend: To mark the 250th anniversary of British troops landing in the city, 150 to 200 Redcoat reenactors will land at Long Wharf on Oct. 6 and parade through town en route to Boston Common, where they will set up an encampment and spend the night. “They will fan out into Downtown Crossing to interact with visitors and residents in the streets, in bars and restaurants, shops, and hotels,” O’Donnell says. Or take them someplace quirky, say, the Mapparium at the Mary Baker Eddy Library (www.marybakereddylibrary.org). It’ll only set you back $6 per person, and that three-story stained glass globe (featuring the world as it was in 1935) is a stunner.